This illustration shows an optically active quantum dot at the overlap of two atomically thin layers of tungsten diselenide, as in the experiment carried out by Chakraborty et al. Image by Michael Osadciw/University of Rochester. Researchers at the University of Rochester have shown that defects on an atomically thin semiconductor can produce light-emitting quantum dots. The quantum dots serve as a source of single photons and could be useful for the integration of quantum photonics with solid-state electronics – a combination known as integrated photonics. Scientists have become interested in integrated solid-state devices for quantum information processing uses. Quantum dots in atomically thin semiconductors could not only provide a framework to explore the fundamental physics of how they interact, but also enable nanophotonics applications, the researchers say. Quantum dots are often referred to as artificial atoms. They are artificially engineered or naturally occurring defects in solids that are being studied for a wide range of applications. 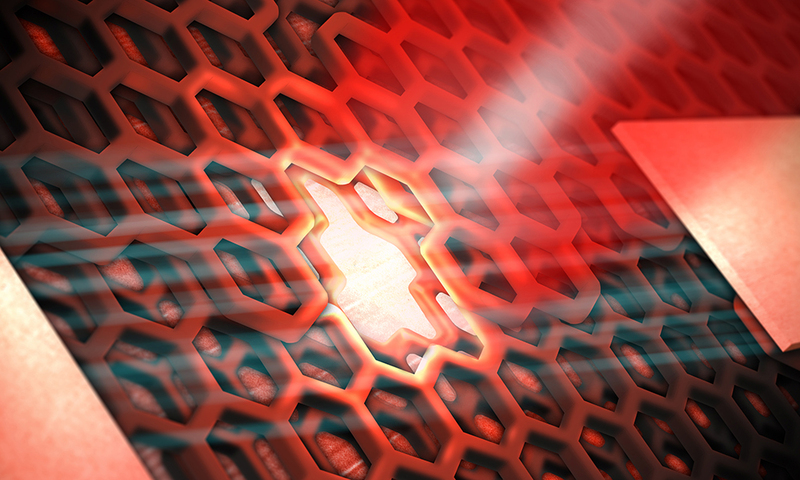 Nick Vamivakas, assistant professor of optics at the University of Rochester and senior author on the paper, adds that atomically thin, 2D materials, such as graphene, have also generated interest among scientists who want to explore their potential for optoelectronics. However, until now, optically active quantum dots have not been observed in 2D materials. In a paper published in Nature Nanotechnology this week, the Rochester researchers show how tungsten diselenide (WSe2) can be fashioned into an atomically thin semiconductor that serves as a platform for solid-state quantum dots. Perhaps most importantly the defects that create the dots do not inhibit the electrical or optical performance of the semiconductor and they can be controlled by applying electric and magnetic fields. Vamivakas explains that the brightness of the quantum dot emission can be controlled by applying the voltage. He adds that the next step is to use voltage to “tune the color” of the emitted photons, which can make it possible to integrate these quantum dots with nanophotonic devices. A key advantage is how much easier it is to create quantum dots in atomically thin tungsten diselenide compared to producing quantum dots in more traditional materials like indium arsenide. “We start with a black crystal and then we peel layers of it off until we have an extremely thin later left, an atomically thin sheet of tungsten diselenide,” said Vamivakas. The researchers take two of these atomically thin sheets and lay one over the other one. At the point where they overlap, a quantum dot is created. The overlap creates a defect in the otherwise smooth 2D sheet of semiconductor material. The extremely thin semiconductors are much easier to integrate with other electronics. The quantum dots in tungsten diselenide also possess an intrinsic quantum degree of freedom – the electron spin. This is a desirable property as the spin can both act as a store of quantum information as well as provide a probe of the local quantum dot environment. “What makes tungsten diselenide extremely versatile is that the color of the single photons emitted by the quantum dots is correlated with the quantum dot spin,” said first author Chitraleema Chakraborty. Chakraborty added that the ease with which the spins and photons interact with one another should make these systems ideal for quantum information applications as well as nanoscale metrology. The paper, “Voltage controlled quantum light from an atomically thin semiconductor,” was published by Nature Nanotechnology on May 4, 2015. Apart from Vamivakas and Chakraborty, the team also included Laura Kinnischtzke, Kenneth M. Goodfellow, and Ryan Beams from the University of Rochester. The researchers acknowledge funding from Rochester’s Institute of Optics and the National Science Foundation (DMR-1309734).